Regular readers of this site know that much of the “evidence” banks try to introduce into foreclosure cases is either inadmissible or sometime just flat-out fake. 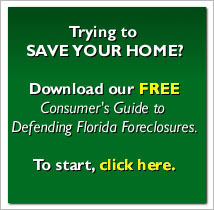 Defense lawyers across Florida are increasingly attacking the validity of affidavits that owners of notes must file with the courts as part of the foreclosure process. Attorneys like Dustin Zacks, of the firm Ice Legal in West Palm Beach, Fla., are successfully arguing that plaintiffs — usually a trust that owns the note or the servicer of the note — are violating court rules by filing affidavits with no records attached to support their foreclosure suits. The records include details of the loan, borrower fees and payment history. Supporting and opposing affidavits shall be made on personal knowledge, shall set forth such facts as would be admissible in evidence, and shall show affirmatively that the affiant is competent to testify to the matters stated therein. Sworn or certified copies of all papers or parts thereof referred to in an affidavit shall be attached thereto or served therewith. The court may permit affidavits to be supplemented or opposed by depositions, answers to interrogatories, or by further affidavits. I’ve seen affidavits in as many as five hundred foreclosure cases, and of those, no more than three actually met the requirements of the rule. Each of those came within the last two months – long after Judge Rondolino’s affidavit ruling made national news. Wasylik said summary judgments that were granted based on insufficient affidavits can be appealed and set aside. “If courts are fooled into granting judgments … it could be disastrous for Florida’s real estate,” he said. The problem with granting foreclosures on flimsy or faked-up evidence, is that they are subject to being set aside, even many years later in some cases. Any home that’s ever been through a foreclosure is potentially subject to having a judgment set aside, and the sale voided – and that potentially means setting aside any subsequent sales to later buyers. foreclosure crisis look like a tiny ripple in the pond. It’s time that Floridians demanded their judges follow the law – because all Floridians will pay a heavy price if they don’t.